Prior to the late April release of my new travel article in stalkingElk, I’ll be previewing a few of the Bohemian oddities that will be featured. This final post is about Prague’s maddest – in every sense – music festival. There are some amazing music festivals in Europe. If you were so inclined, you could start the party season at the multimedia, Renaissance subculture festival Netmage in Bologna, take a break at the arty, classical ponce-fest that is St. Magnus on Orkney and then end your summer with the intimately Arctic mish-mash rave of Iceland Airwaves in Reykjavik. But for all Europe’s unusual, eclectic music festivals, none come close to the bizarre two-day summer music and theatre bonanza that is Prague’s Mezi Ploty. A must for any real festival-goer’s diary, Mezi Ploty is possibly the weirdest weekend ever devised. It’s the only major music festival in the world held in the grounds of a working psychiatric hospital, and featuring artists who are, to quote the official website, ‘mentally disadvantaged’. Good on them, I hear you cry… but that’s not the strange bit. You see, rather than having all those poor Randle McMurphy/Chief Bromden-types cooped up inside with earplugs firmly lodged in their skulls, they’re instead allowed out to mingle with the festival crowd. The organisers claim it’s to improve mental health awareness and break down social barriers (could you spot the madman at a music fest? ), while cynics claim that the whole thing is a cheap gimmick to get in punters. Either way, the crowd are mad for it. To experience the Mezi Ploty festival this year, you’ll need to get your skates on – it’s held on the 28th and 29th May at Bohnice Psychiatric Hospital. You can find out more by visiting the Mezi Ploty website (in Czech only, I’m afraid). You can read the full article – Weird beards and other Bohemian oddities – in the April edition of stalkingElk. Prior to the April release of my new travel article in stalkingElk Magazine, I’ll be previewing just a few of the Bohemian oddities that will be featured. This final post is about one of Europe’s weirdest music festivals. There are some amazing music festivals in Europe. You can start the party season at the multimedia, Renaissance-tinted subculture of Netmage in Bologna, take a break at the classical ponce-fest of St. Magnus on Orkney and then end your summer with the intimate Arctic mish-mash of Iceland Airwaves in Reykjavik. But no festival-goer’s diary is complete without possibly the weirdest summer music festival ever devised… Mezi Ploty. Strong words, right? Well, judge for yourself. 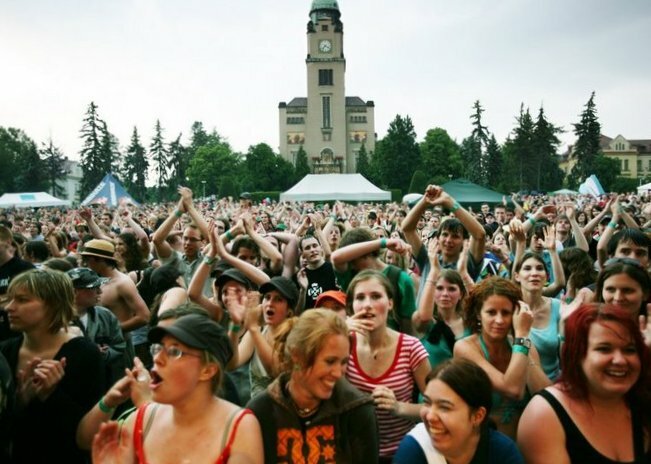 Prague’s infamous Mezi Ploty is the only major music festival in the world held in the grounds of a working psychiatric hospital, and featuring artists who are, to quote the official website, ‘mentally disadvantaged’. Good on them, I hear you cry… but that’s not the strange bit. You see, rather than having all those poor Randle McMurphy/Chief Bromden-types cooped up inside with earplugs on, they’re allowed to roam freely around the grounds. That means mingling with the crowd. The organisers claim to be improving mental health awareness and breaking down social barriers, while cynics claim that the whole thing is just a cheap gimmick to get in punters. Either way, the crowd are mad for it. To experience the Mezi Ploty festival this year, you’ll need to be in Prague between the 28th and 29th May. To find out more, click here to visit the website (Czech only). The new issue of stalkingElk, featuring my article Weird beards and other Bohemian oddities, will be released on 6th April 2011. This entry was posted in Travel Blog and tagged Joseph Reaney, Writing, bohemia, Copywriter, Festival, Joe Reaney, journalism, Journalist, Freelance, Travel Writer, seo, social media, bohemian, stalking elk, stalkingElk, weird beards, bohnice, cuckoo's nest, gimmick, iceland airwaves, lunatic, mad, mental health, mezi ploty, music, music festival, netmage, psychiatric hospital, psychiatricka lecebna, st. magnus, Prague by Joseph Reaney. Bookmark the permalink. This festival sounds absolutely crazy. Literally! LOL, SICK, URGH. I live in Prague but I did not manage to go along sadly this year (I instead went to the food festival which was on the same weekend instead). Next year I will go to Mezi Ploty for sure!